As my first official duty, I would like to take this opportunity to recognize the contributions of our outgoing president Mark Romness, MD. The past year has had a number of legislative challenges and we are indebted to Mark and all those who have assisted him in navigating the political minefields and protecting our profession. While we have had successes such as the SGR repeal, issues such as PODs, and particularly fairness and openness in compensation associated with the management of Workman’s Compensation care, remain hot topics that will require our close attention. Second, I would like to congratulate the 2015 VOS meeting’s Co-Chairs James Browne, MD and Gregg Golladay, MD on another outstanding meeting and offer thanks to our presenters. In particular, I would like to thank our invited speakers Armen Kelikian, MD, Daniel Berry, MD and Sean Singletary. I would also like to thank AAOS President David D. Teuscher, MD for attending and providing us an update and perspective on our national governing body. 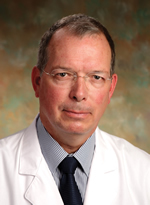 For the 2016 meeting, Brad Butkovich, MD has accepted the position of Program Chair with assistance from Ilvy Cotterell, MD from VCU, Winston Gwathmey, MD and Truitt Cooper, MD from UVA, and Trevor Owen, MD from Carilion. 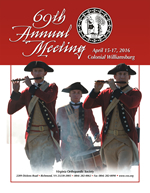 The meeting will be held in Colonial Williamsburg April 15-17. We will be expanding the CME hours available and reformatting some of educational options in addition to providing focused educational access to our ACP providers and physicians with non-surgical MSK interests. Finally, I must echo a recent past president who posed the question of “why belong to VOS?” I can offer two reasons. First, political - over the past several years, I have come to recognize that on a political level, grassroots involvement is how we determine our destiny. We can choose to work from within or be dictated to. The VOS is how all of us, member and non, maintain our place in the process and have a say in our professional and fiscal viability. It is impossible to say enough about what goes on “in the background” but each of us must recognize that we cannot simply sit on the sidelines and expect someone else to take care of us. If not as one in the political trenches (and thank you to all of those who take the time from practice and family to represent us on the political “face to face” level), we must at least participate fiscally by support of our PAC. Second, educational – over the time of my VOS Board involvement I have seen how each year we have grown as an entity recognized for how our annual meeting encourages our students and residents, by the quality and breadth of our presentations and visiting faculty and as a forum where there are no “sacred cows” and where give and take and discussion in an open arena is encouraged.